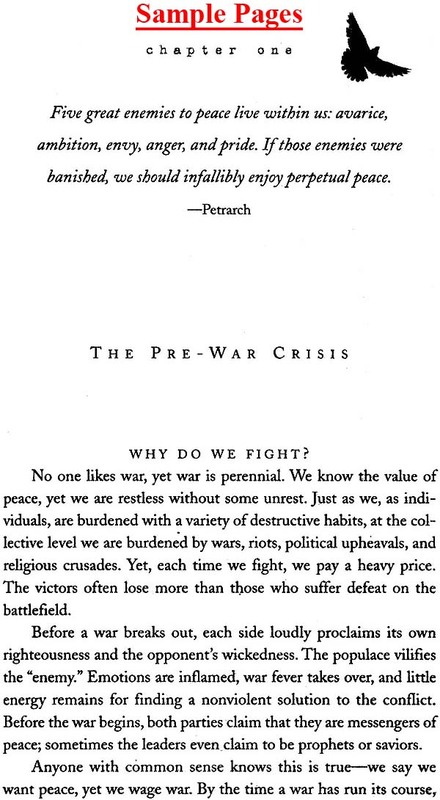 War is an ancient-and primitive-way of dealing with conflict. Why can't we find a better way? 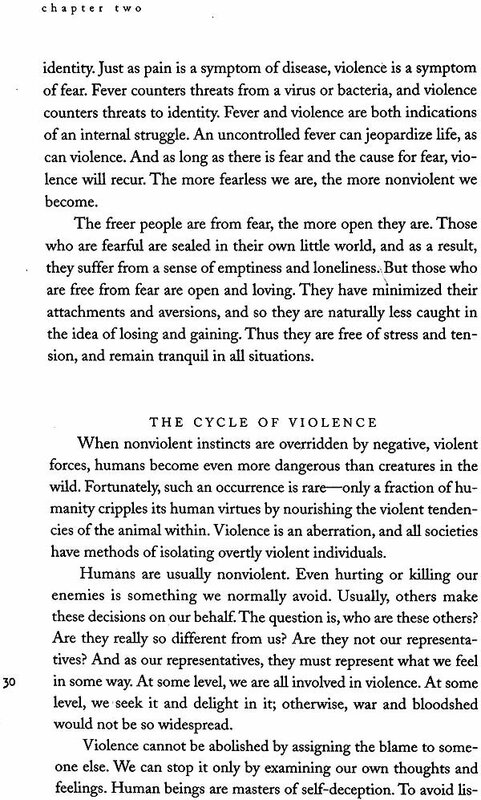 What are the root causes of violence? Is it possible to build a truly lasting peace? If so, where do we begin? Practice we can replace greed, desire, jealousy, and anger with compassion, tolerance, and love for ourselves and others. 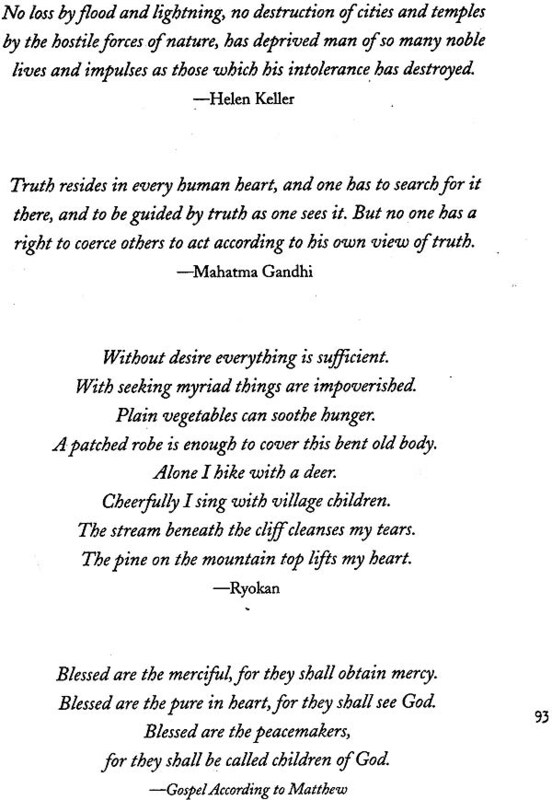 Cultivating these qualities in our daily lives gives us the power to change the world. Originally published under the title Yoga on War and Peace, this revised edition features a new foreword by Deborah Willoughby, editor of Yoga international magazine, and new chapter of inspirational contemplations drawn from the world’s great spiritual traditions. Spiritual head of the Himalayan Institute, Pandit Rajmani Tigunait is the successor of Sri Swami Rama. He holds two doctorates, one from the University of Allahabad in India and the other from the University of Pennsylvania. He is a regular contributor to Yoga International magazine, the author of numerous books including the best-selling, At the Eleventh Hour and the force behind Sacred Link, The Healing Revolution. Ours is a violent world. War, insurrection, border incursions, mutiny, assassination, and just plain murder are woven into the fabric of human life. It's always been bad, and it's getting worse. According to the Peace Pledge Union, there have been more than 480 wars since 1700, resulting in more than 120 million deaths. And almost all of these people-95 percent-were killed in the twentieth century. How many is that? Estimates range from 115 to 140 million. That's an enormous range to be sure-25 million lives-but oddly enough, in an era awash with statistics, precise causality figures are impossible to come by. There's no official agency charged with keeping a running body count, and the pitfalls of relying on information from parties to the slaughter are obvious. Absolute numbers don't matter much anyway. Huge casualty figures numb the mind. We can comprehend the horror of a night- club fire that kills 97, or Gust barely the attack on the World Trade Center with 2,863 dead, but figures in the hundreds of thousands-not to mention the millions-aren't human lives anymore, they're just statistics. Organizations concerned with tracking war define an armed conflict as fighting that leaves a minimum cumulative total of 1,OOO people dead. Sit for a moment and imagine the anguish that the loss of the two people nearest you would wreak in your life and the lives of those who depend on them. Take it ail in and then multiply the wreckage by 500 (500! already the imagination wobbles) and you have a measure of the devastation caused by the smallest of the world's ongoing armed conflicts. In December of 1999, there were forty such conflicts raging in thirty-one different countries. So here we are, looking over our shoulder at a century with a body count well above 100 million and no reason to believe that the numbers will do anything but rise-millions upon millions of lives snuffed out because we have never discovered how to manage our affairs without recourse to arms. This has got to change. The world is growing smaller and our weapons are becoming more potent (and more portable). It's way past time to get serious about extricating ourselves from the carnage. In one sense, it's a simple matter. The saints and sages of all the great traditions tell us that war has its roots in a massive case of mistaken identity. "There's nothing to fight about and no one to fight with," they tell us. "We are all one. All things, all people are made from one essence and destined for one aim." And what is that aim? Page through the last section of this book and listen to the voices echoing down the centuries and across cultures-saints and sages, rabbis, priests, imams, ministers, sadhus, and lay women and men from all traditions. "The phrase 'each other' doesn't make any sense," a thirteenth century Sufi poet proclaims. Or, in the words of a contemporary Buddhist, "When we look into our hearts and begin to discover what is confused and what is brilliant, what is bitter and what is sweet, it isn't just ourselves that we are discovering. We're discovering the universe." Einstein put it another way, "A human being is part of the whole, called by us 'universe,' a part limited by time and space. He experiences himself, his thoughts and feelings, as something separate from the rest-a kind of optical delusion of consciousness." The sage of the Mundaka Upanishad put it more simply, "The Lord is one light shining forth from every creature." The aim we are all destined for is to know ourselves as that light. 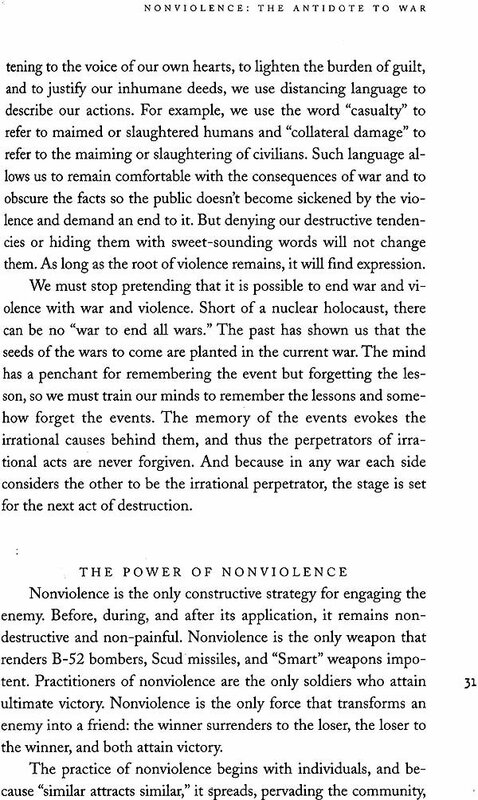 And when we do, violence vanishes. In the words of a Sioux holy man, "Peace comes within the souls of men when they realize their relationship, their oneness, with the Universe and all its powers." There's a part of all of us that knows this is true. So why do we struggle so hard to hold ourselves separate? To assert "my" identity as apart from "your" identity, to make sure your rights aren't diminishing mine? Why are we so quick to feel threatened when your un- distending of God differs from mine? The answers are the subject of the chapters that follow. 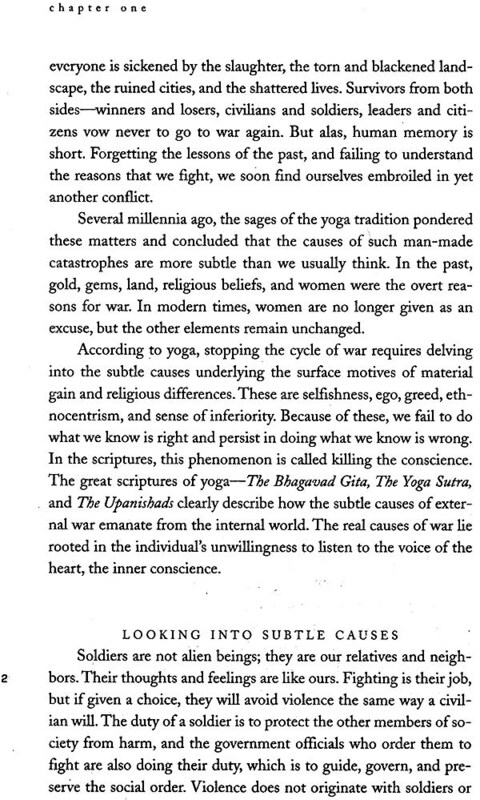 But the author-a yoga master who has spent a lifetime helping people from all cultures overcome the obstacles to self-transformation-is offering us more than an inspiring explanation of why we fight and how we can stop. If inspiration alone were enough, the violence would have ended long ago. 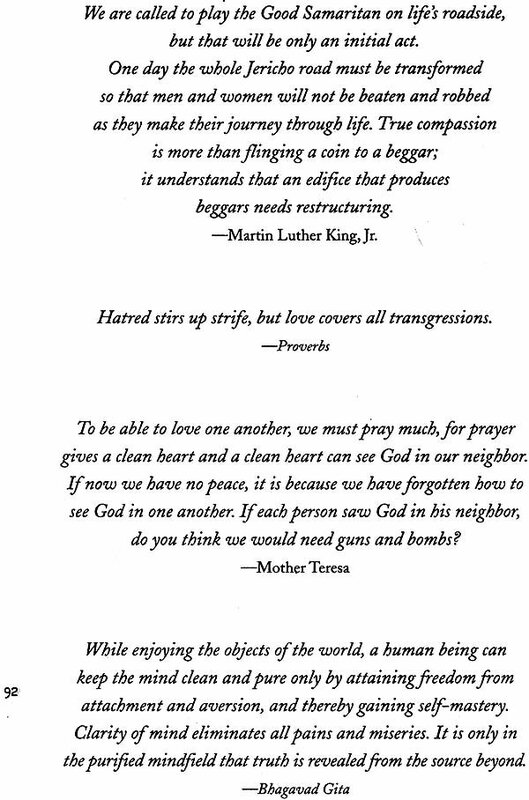 How much eloquence has been poured into pleas for peace? Over how many centuries? How many committed, impassioned people have devoted their lives to ending war? Yet the fighting goes on. 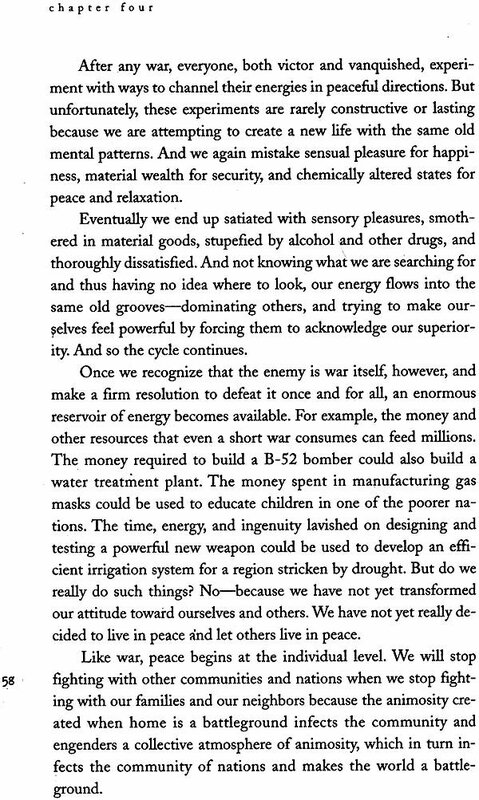 Lasting peace bubbles up from the same wellspring that feeds war-the depths of the human heart. 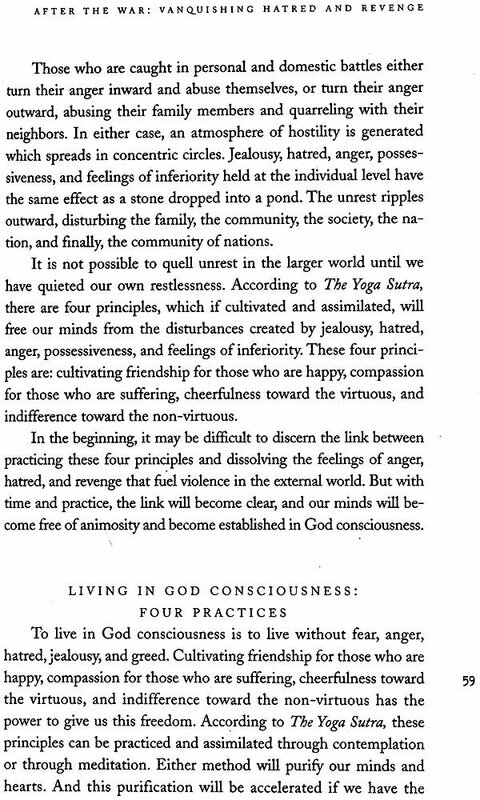 That is the message of all of the world's great spiritual traditions. Here in these pages Pandit Tigunait offers us a series of practices-universal in appeal and application-for shedding our mistaken identity. When that drops away, when we know ourselves as light, we will find ourselves, in the words of Swami Rama, "to be part of the universe, and the universe to be part of us." And in that knowledge lies the seed of true and lasting peace. 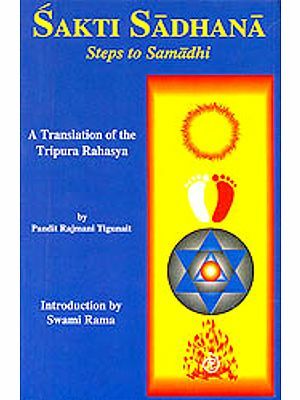 by Pandit Rajmani Tigunait, Ph.D.
by Panda Rajmani Tigunait, Ph.D.